Game of Thrones hitching a ride with American Gods to the Wild West. Though I’m a regular fantasy reader, this is my first brush with Westerns. Overall, I found it an intriguing, but uneven experience. Elim, a mule working for young Sil Halfwick, follows his headstrong employer to the town of Sixes on the other side of the border. For Elim, the sooner they get back on the right side of the river, the better. But Sil, with a grand horse dealing plan in mind, has other ideas. Maybe this place had turned him into a murderer. Elim couldn’t have said whether it had that power. But it was certainly fixing to turn him into a dead man. The first thing you need to get your head round in this story is the language – specifically the names. Characters and Tribes have unusual names and there are many, introduced quickly, to keep track of. The story itself uses a sort of dialogue too. Whether this is specific to the book or general parlance for Western fiction (a ‘mule’ for example is not an animal, but a person of mixed race), I’m not sure. There’s a glossary at the back that explains some of this but unfortunately I didn’t discover it until after finishing the book. Sixes borrows a trick from works like Game of Thrones, in that it uses multiple character viewpoints to tell the story. While I’ve not found this to be much of a problem in the past with books like GoT and Pillars of the Earth, here I found it quite confusing. Given that as a reader, you’re already coming to terms with a secondary world universe, characters that aren’t always human and a whole new dialect, for me this was a step too far. Which is a shame because these layers of additional complexity hide what’s actually a very novel and inventive storyline. The town of Sixes itself is about as far away from the cliched cowboys and indians frontier town as you can get. It’s a hotbed of plotting, factions and struggles for status and position. And perhaps most interesting of all, it appears to have two different sets of inhabitants; the day folk and the night people. Into this rattlesnake’s nest wander Sil Halfwick, the cocksure young wheeler dealer and Elim, playing the part of the noble savage. At which point, all hell breaks loose. The plot certainly keeps you on your toes, with enough twists and turns to keep even the most cynical plot predictor guessing. I can definitely say that from about a third of the way in, I turned each page without a clue what was going to happen next. After so many cookie cutter YA dystopian romances and boy-is-the-chosen-one epic fantasies, this was really exciting! But, as I’ve touched upon earlier, sadly hampered by the level of complication, not just in the book’s accessibility, but in its world building and storyline. 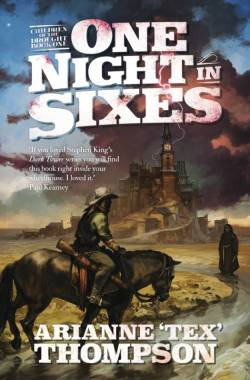 Sixes feels like maybe the second book in a series, so I was surprised to discover it was the first in a set. There seems to be the assumption that the reader is already familiar with the world in which it’s set. But even if you read the glossary and character list first, I still think there needs to be a little more introductory explanation, so that we spend less time trying to figure out where we are and more time becoming immersed in the highly original and suspenseful plot. Put the glossary and character list at the front and add that early explanation and this book could easily go from three stars to four, or even five. A great read for suspense enthusiasts looking for something different on their fantasy bookshelf. But be prepared to put the time into making sense of the world, and possibly re-reading to get the full benefit. I agree w/the loris: kept thinking I’d missed the first book in the series! For most current serialized lit today that isn’t a problem. But ‘Tex’ has started successfully something I’ll stick around till the finish!